As a tech blogger and mom I’m always concerned about my children’s safety, whether it’s online, offline, or out and about. With back-to-school around the corner it’s a good time of year to re-evaluate what methods we have in place to address these concerns. 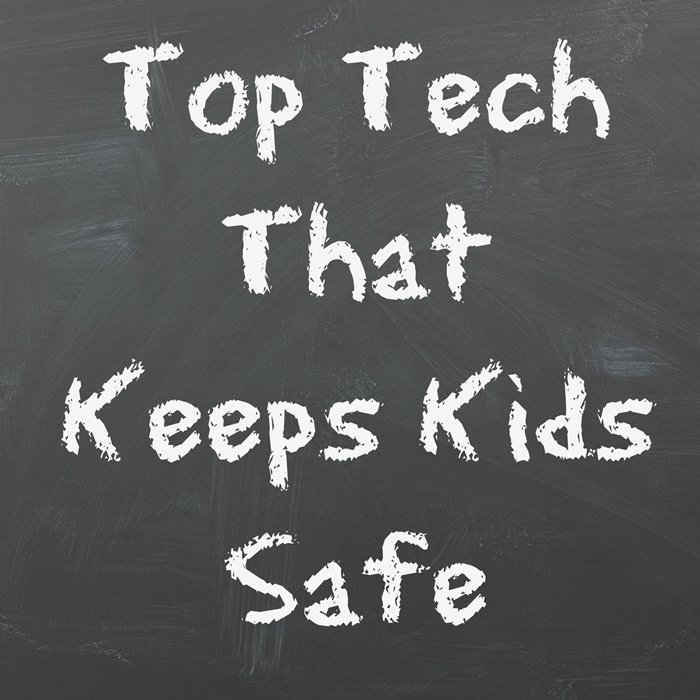 Thankfully there is a lot of tech out there these days that can help us as parents, and I’m excited to work with The Learning Care Group to share with you the top tech apps, sites, devices and wearables that keep kids safe. 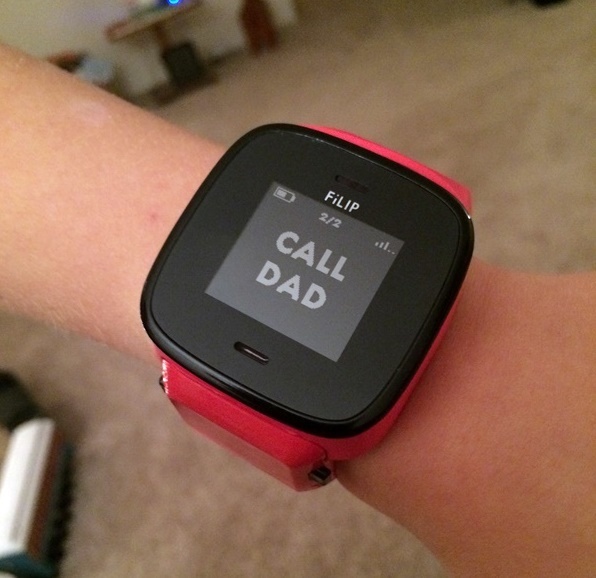 As you can see, the FiLIP 2 is worn on a child’s wrist. The screen is very large and easy to see. It’s also very simple which allows it to provide everything kids need to stay in touch and none of what they don’t. This allows you to contact your child or for them to reach out to you, and it provides location information and has an emergency mode. At the same time, it doesn’t offer games or the ability to text others, which are things we all know they will be doing when they’re older. This is great if you worry when your kids ride their bikes around the neighborhood or go to a sleepover. You can reach each other easily and, if necessary, your kids can trigger the emergency mode with the touch of a button. The FiLIP 2 has combined GPS, GSM, and WiFi all on one chip and they have a proprietary algorithm that determines which to use for the strongest signal. For example, if GPS isn’t working well inside a building, it will use WiFi and cellular capability to provide location information. Using the app you can see your child’s location on the map at any time. It only works with five phone numbers that kids call and receive calls from. If you want to call your child, you open the app, select the child, and the FiLIP 2 will ring. You can also set it up so a child can call another child like a sibling, who also has a FiLIP 2. The FiLIP 2 also offers one way text messaging. It can receive text messages only from the parent’s app. Messages are short at only 24 characters long but you can text a short note like, “Dinner’s ready!” This allows you to stay connected without calling. I recommend the FiLIP 2 to anyone with kids in their lives who are looking for peace of mind as your children gain independence. It’s a fantastic wearable phone and smart locator with a trendy design that kids will be excited to wear and it will keep parents breathing easier knowing it’s working hard to keep their kids safe. This is a device that I believe every family should own. 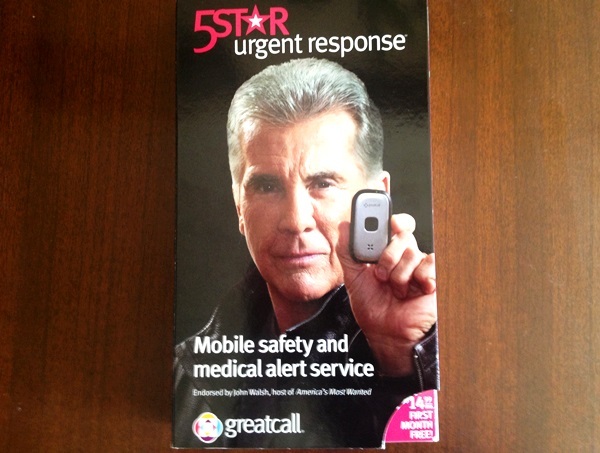 The 5Star is a GPS enabled device that’s smaller than a flip phone and enables you or your children to get help anytime, anywhere. Some of its features include: simple one touch operation, built-in patented GPS, technology that is activated when you press the button, connection with 5Star agents trained in CPR and other emergencies, high performance microphone and speaker so conversations are loud and clear, and no cell phone is necessary. If your children are old enough to ride their bikes around the block or the neighborhood but you find yourself fretting with worry while they are gone, the 5Star can help give you a bit of peace of mind. It’s small enough to fit in the pocket of an older child and if they need to use it in an emergency they simply press the button once and their GPS location is immediately activated and help comes on the line. If they can speak and explain the situation the agent will talk them through it and send help. If they are unable to speak the agent will send help right away. If they hold the button for five seconds they will be directly connected with 911. The 5Star can also be used to ask for directions and other general information which can be helpful as well. I recommend this device for any parent that is looking for a solution to help keep their children safe. Note: 5Star also has an app as well, which is helpful for those with older children who have phones. Learn about the 5Star app here. 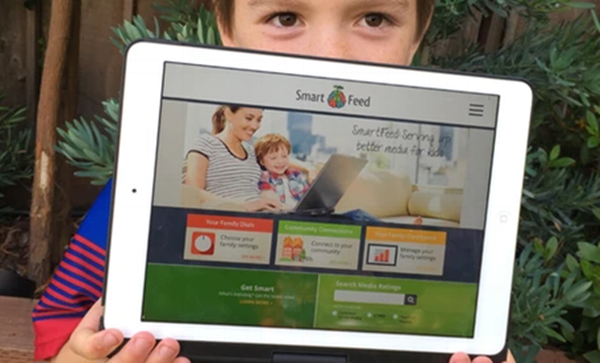 The goal of SmartFeed is to feed kids positive, engaging, healthy content whether it’s online books, apps, games, movies, and more. It is a platform where you set up accounts for your kids and enter in info like gender and grade level and then you can select categories like interests, curriculum, situation, ratings, filters and more. You can easily use slider bars to set different levels for values for things like anti-bullying, independence, adventure, giving back, creativity, and more. There are slider bars for curriculum subjects and interests, as well. In SmartFeed you can also set usage limits including on and off times as well as duration. Very handy for parents concerned about the amount of screen time their children are getting. There is also the option to award bonus time. Once the accounts are set up, families and children can browse all the suggestions for books, apps, movies, and games. As a parent, it’s wonderful to know that your child is seeing positive and healthy content and not to have to worry about what they might run across. It is all is so simple and so smart! I recommend it to any parent out there who wants a better way to manage their kids’ digital media. SmartFeed was a Kickstarter project that successfully reached their funding goal. You can visit the SmartFeed website to sign up as a Beta Tester. 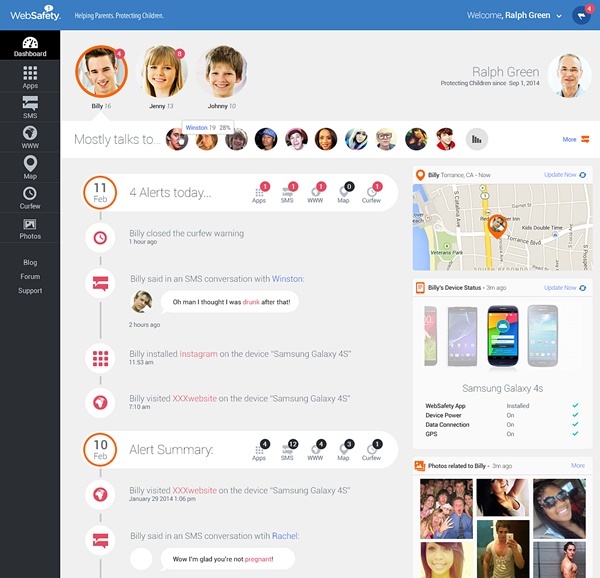 WebSafety sends parents real-time alerts to help protect their children from online dangers such as cyberbullies, sexting, and internet predators. The patented technology gives parents analytical tools to watch for alarming patterns and behaviors while children and teens are using their smartphones. It also helps parents see where their children are and sets a curfew so the device isn’t overused. It’s good to know that our kids can experience a bit of freedom these days without parents wringing their hands with worry. Whether it’s browsing online for media, the first time riding their bikes around the block, their first sleepover, or they just received their first smartphone, tech that keeps kids safe has become an important part of our lives. We can all breathe little easier knowing these tech and gadgets were designed with our children in mind and to allow us to give them that important age-appropriate independence that will help them grow and thrive.